"What Are Skin Weft Extensions?" Skin weft extensions or skin weft hair extensions (also known as adhesive weft hair extensions, tape-in weft hair extensions and tape hair extensions) are a form of weft hair extensions. The hair is held together by a strip of PU strip or an adhesive tape that remains sticky enough to adhere to the wearer's growth hair - there are also hand-tied skin weft hair extensions. There are further varieties but these incorporate other methods of hair extensions like skin weft hair extensions with small micro rings attached so that stick tip (I-tip) hair extensions can also be attached. They are often referred to as skin wefts as the wefts of hair are very thin, don't contain any seams and lie flat on against the head (enlarge the image twice by clicking the expansion bod top right of the enlarged image window). How are skin weft extensions attached? There are different ways to attach skin weft hair extensions. If you're using a single sided version of skin weft hair extension, then you can follow the image above and fold the thin skin weft hair over to secure it to your hair - folding it over helps ensure that the skin weft hair extensions won't slip off the growth hair. If you're using the double sided sticky tape version, you can use the following steps. Part the hair into sections where the tape hair will be attached. Hold the sections in place with a hair clip. Peel the label off one side of the skin weft extension and leave the other side covered. 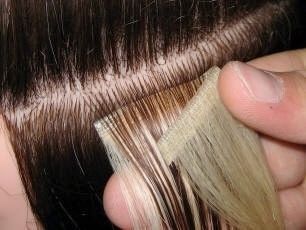 Attach the exposed side of the tape hair to the growth hair as close as possible to the roots but not on the scalp. 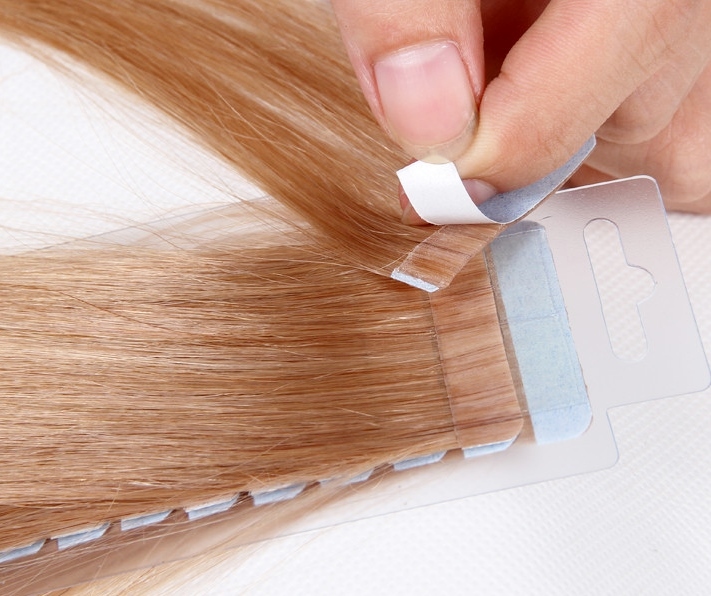 Peel off the other side of the label covering the tape and take a thin section of growth hair immediately above the skin weft extension and press it against the tape using the tail of the comb. What about textures for skin weft extensions? There is a fairly broad range of skin weft hair extension textures which includes the usual suspects like: silky straight, Yaki straight, blow dried Afro straight, body wave, water wave, curly, loose Afro curl and Afro curl. Hair extension savants will notice the absence of deep wave from that list because it's not readily available. The curly textures make an appearance but they aren't particularly abundant either; so if you luck out on finding a retailer that stocks them it may be worth considering weave hair extensions instead. How do you care for skin weft extensions? The best way to describe how to care for tape extensions is to say that it's a bit like caring for glue in hair extensions and micro ring hair extensions. Oils and conditioners can be used on tape extensions, but these must not touch the adhesive tape tabs at the top of the skin hair weft. It also means you have to be sure to tie the hair at night and comb (groom) the hair no more than three times a day. How do you remove skin weft hair extensions? If you're a seasoned hair extension wearer then you'll be familiar with the different ways to remove bonded hair extensions and tape hair extensions follow a similar pattern. There are various adhesive removers for hair extensions, branded and unbranded which usually have names like Tape Weft Removal Spray, Tape-in Bond Remover or Weft Release Remover. Adhesive tape skin weft removers tend to work in a similar way whereby the removal product is applied to the adhesive section of the skin weft hair extensions, allowed to saturate the area and then the skin weft can be gently removed from the growth hair. That's the scoot through skin weft extensions and if you want to keep up to date with the next guide about hair weaving extensions, other types of hair extensions, wigs and hair pieces then join our blog, or check the Hair Extensions Q&A section for more answers to more questions or use the navigation menu.